Play the bonus game to catch a secret society member's murderer! 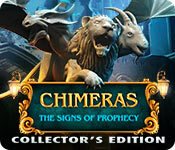 Chimeras: The Signs of Prophecy Collector's Edition is rated 3.9 out of 5 by 41. Rated 5 out of 5 by megwoman25 from Review Of Completed Game Oh My What A Surprise This Game Was!!! I absolutely loved the first one in this series but sequels never seem to live up to the first however this game just knocked my socks off! First of all, the graphics/soundtrack in this game are superb. I have always loved Elephant games but their soundtracks really are amazing. The dramatic music while exploring something sinister and when you meet different characters it changes to something more suited. The music in this game really helps enhance the graphics and overall theme/setting of this game. The voiceovers are really well done! It didn't sound like people were just reading from a piece of paper all monotone like in some other games. 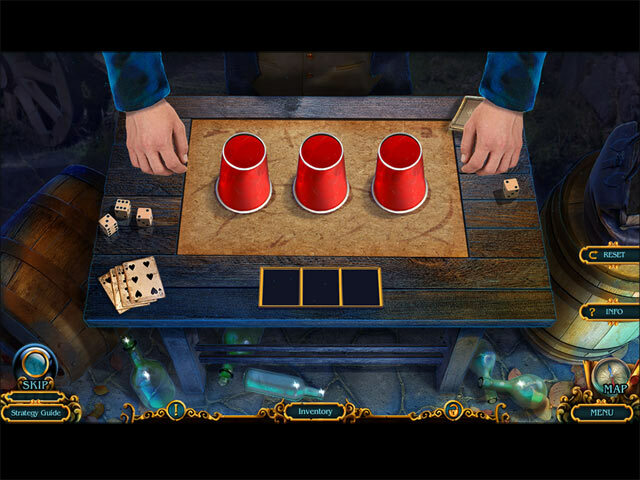 The hidden object scenes were mildly interactive like moving items to locate other items or matching a certain number of objects. However the scenes were so beautiful that I wasn't bored by the lack of innovative scenes. They worked for the game. There were a good variety of puzzles in this game. Most were easy to complete, a few made me have to use my brain which I love. I wish more games made me use my thinker. There are also lots of extras in this game! Morphing objects, Chimeras and tarot cards to collect. They are all pretty easy to spot although a few morphs did get away from me. Bonus chapter added about 45 minutes. The entire game took me 4-5 hours I think? I became so into this game I seemed to lose track of time which is a great thing! I can't remember the last time I started a game and finished it within a day or so. Usually I am so bored, I put them on my desktop to finish later and never get there! The plot line was familiar yet I really liked the cast of characters. The Wanderer kind of made me laugh with his dorky voice and weird mannerisms. The bonus chapter is not needed in order to finish the story. In fact it really has no relation at all except that it has another supernatural being trying to take over and you need to do the deputy a favor and help solve a murder. I would usually say to buy the SE but the extras in this game were really good. Also, I usually hate secret rooms and see no added value to the game but this one was a bit different. You had achievements within it to do it in 6 minutes, use no hints, etc etc. You are finding X amount of morphs in rooms. I found it quite hard to be honest. It was hard to see certain items and I didn't do it in 6 minutes and its the only part of the game I needed hints LOL But I found it somewhat interesting and fun. Thing is, if you don't get the achievements, you can't go back and try to improve your score. Its like a one time deal so you'd need to play the game again to do any better. I also didn't see a way to go back and find any collectibles you missed. BUT I got them all so maybe I didn't see a way because I didn't need to. Morphs/Cards go into the bonus chapter as well. I rarely give games 5 stars and I really didn't expect to like this game as much as I did. Games lately have been soooo boring and lackluster and I am so glad to know that there are still some games that are mind blowing. Elephant has always been a great developer albeit some of their games probably need to end...(I am looking at you Grim Tales & Mystery Trackers...) However this is a great newish series and hopefully they do the series justice and keep bringing out new good games. I definitely recommend!! Rated 5 out of 5 by genenut from Nothing I didn't like about it. Everything was great. Loved the new puzzle changes. A good mix of puzzles. Storylines are all much the same, how much more can be done? This one makes it enjoyable even though it is so often the theme. Rated 5 out of 5 by Firehorse66 from Loved the puzzles good game Great puzzles but most were too easy. Fun game lots to do and places to go. I love the sound the puzzles make when it opens to the puzzle. Bonus game was a tad short but fun nonetheless. Rated 5 out of 5 by timothya from Short and Fun Crank up the difficulty level a bit on this one unless you're a beginner. 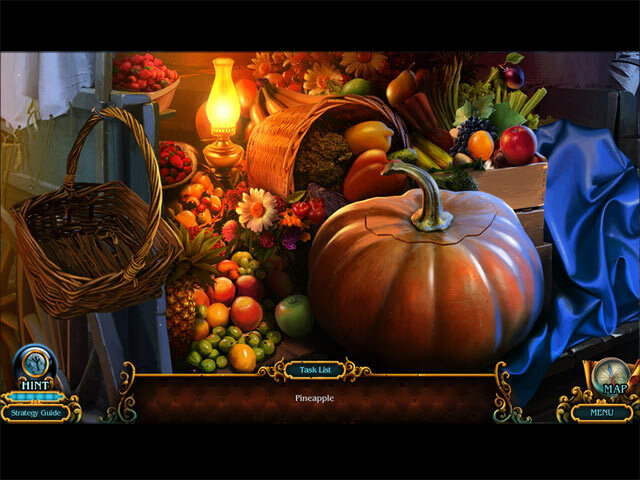 It's short, the games are plentiful and easy, the hidden object scenes straightforward and clear, and the plot coherent. The five star review is based on only one overweening factor it's Just Plain Fun! Lots of little things, but they add up. Graphics gorgeous as we've come to expect from this developer, the Munich scenes enjoyable on their own over and above any game play. Music appropriate, varied, and atmospheric. Voice acting quite competent and either painfully or charmingly American depending on your point of view. Your little orphan friend was actually cute instead of cloying for a change. Smooth game play, smooth scene transitions, just the right number of cut scenes. I usually find morphing objects irrelevant and distracting, but these weren't. If you need to introduce a rookie to this genre, this is definitely a game to hook them on! Or, for that matter, a young person: the plot was devoid of splatter and ultimate evil and the player was left with the impression that pretty much everyone he or she met was a decent human being without the plot resolution being overly sappy. Nicely done, writers. Just fun. What else do you need? Rated 5 out of 5 by jocasta1 from Fantastic! After having played some disappointing demos lately, I was very pleased to come across the latest Chimeras. This is a flat out 5 star game! The story is interesting, the characters are unique, the puzzles are a little off the beaten path, the graphics are wonderful, and the voice overs fun, An absolute pleasure to play. As well, the CE features are actually worth the extra cost, with 18 good wallpapers, achievements, and 3 types of collectibles (tarot cards, chimeras, and morphing), This games shows a lot of attention to detail and doesn't skimp on anything! Rated 5 out of 5 by heartblob from Chimeras The signs of prophecy spectacular this is yet another brilliant Chimeras game, graphics spectacular, music great , get engrossed in this game ,plenty to do ,tarot cards to find, morphs to find and chimeras so plenty to keep you busy, I too have wondered if we would get another Chimeras, and this does not disappoint. excellent we hope to have more Chimeras. Rated 5 out of 5 by pennmom36 from KEEPERS OF THE PROPHECY There is no scientific explanation for the sun's total eclipse that has occurred over the town of Munich. This eclipse is just the beginning, soon the water will darken, the trees will wither and die, the Wanderer will be exposed, as will the 4 Keepers of the Prophecy. You're no stranger to this kind of phenomenon, in fact, it's your specialty, but digging deeper into this apocalyptic prophecy reveals that you might just play an important role here, because your choices guide the Wanderer's path, directing him towards creation, or destruction! You can always count on Chimeras to deliver us a fantastic story! The graphics and ambience are perfect for this "end of days" scenario, and exactly what you'd expect during an unexpected and unexplained total eclipse, where uncertainty and a sense of uneasiness prevail, where speculations run wild and panic ensues. No, you're not seeing things, the Chimera is real, what once was no more than a slab of stone representing a mythical Greek monster, is now capable of flight and fright. This creature has the head and front legs of a lion, the head and back legs of a goat the head and wings of a fire breathing dragon and the tail of a snake. The only defense you'll have against this Chimera is an Ancient Amulet (because there is no such thing as a Modern Day Amulet) you discovered that repels any living statue. There are Plus Sign inventory items available that require some type of interaction or even a small puzzle solved before the item can be used. This Collector's Edition has the typical Achievements to earn and several Collectibles, 13 Tarot Cards to find, 19 Morphing Chimeras, and 27 random Morphing Objects throughout the game. I am a little disappointed in the Morphing Objects, although the cursor doesn't change to a hand to give away their location, the Morphs are very large and morph so quickly that you cannot overlook them. I prefer Morphs to change slowly, better yet I like it when games are nonlinear and you have to trigger the morphing action in another scene, never knowing when and what triggers the action, that's so much more challenging and fun. The Hidden Object Scenes are a bit scarce, but I suspect that the devs realize that the HOP are getting old, and today's gamers want more Mini Games and puzzles. There are traditional Interactive listed items, Silhouetted Shape finds and Story oriented finds where you find items that match the Keywords in a small story. Not bad, but then again, there's not a whole lot that can be changed in a Hidden Object Puzzle. The Mini Games are decent, but not very challenging, most games can be solved within the first attempt. I'll briefly "describe" some of the games within the demo: 1) Sliding gears and boxes around so that the gears on the inside will connect to the gears on the outside. 2) Changing the amount of liquid within several bottles as shown on a diagram. 3) Pressing cash register buttons a specific number of times as shown as roman numeral clues. 4) Swap Books to create an image on the spines. 5) Swap feathers on an owl correctly. 6) A multi puzzle game where you tinker with 4 different types of puzzles, lighting all lights, removing tangled bars, finding matching pairs, recreating 3d images with stars. This Collector's Edition has 18 Wallpapers, 16 Concept Art pictures, 5 Music Soundtracks, 1 Screensaver, 13 Tarot Cards, 19 Morphing Chimeras, 27 Morphing Objects, Achievements, a Secret Room, a built in Strategy Guide and a Bonus Adventure, enjoy! Rated 5 out of 5 by HappyMommy332 from YES, ANOTHER CHIMERAS, FINALLY!!!!! I have been waiting and waiting for another chimeras game. the last one is on my favorites list and now this one will be going on that list. graphics were terrific and the music was eerie, although I tend to play with music down or off. storyline was great and kept my interest right until the very end. You can collect chimeras and tarot cards and there are morphing objects as well. There is a custom setting which I like and a transport map. On the night of an eclipse statues come to life and people are dead. find out who the wanderer is, is he evil or good? friend or foe? I highly recommend this game.. go ahead give it a try! !